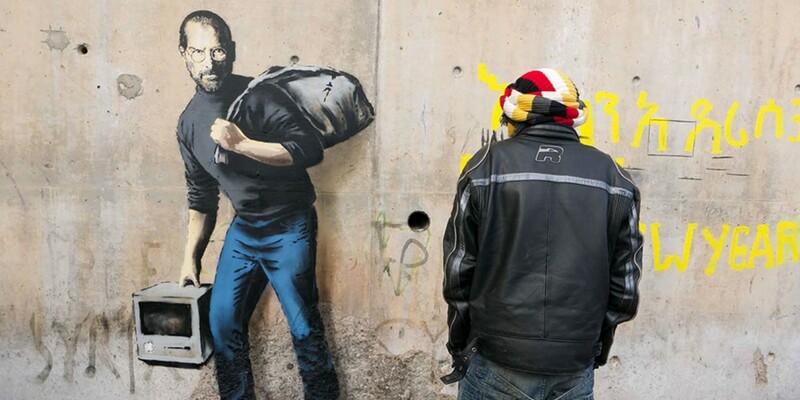 Banksy has turned his attention to the late Steve Jobs in order to try and shine a light on the tragic living conditions and bleak outlook for refugees living in makeshift camps in Calais. The graffiti artist is using Jobs to capture the world’s attention as he was the son of a Syrian migrant who moved to the USA, and ultimately went on to co-found and lead the most valuable company in the world. Once Banksy’s Dismaland bemusement park project closed earlier this year, he decided to put the materials to use building shelters. So far, 12 buildings, a play park and a community area have all been built out of the remains. It’s not the first time tech has been used to try and highlight the lives of refugees to people unaware of the crisis – there’s also this version of Mario made by a Syrian man – but a high-profile artist like Banksy draws a whole lot more attention.